This 12-minute collection of videos features sarcoma specialists explaining clinical trials and their role in sarcoma care. Cancer occurs at all ages. Some cancers are more common in young patients, some in older. The site of origin, likelihood of spread to other areas of the body, and predicted outcomes for a specific cancer are much more dependent on the type of cancer than on the age of the patient. Ewing sarcoma behaves in the same manner in a 35 year old patient as it does in a 15 year old patient. Our objective should be to find optimal treatment for every patient and to learn as much as we can about specific cancers to improve those treatments. For many patients, participation in clinical trials provides access to treatment that represents the distillation of the thinking of dozens of experts in that specific cancer. Artificial barriers based on age can obstruct patient access to clinical trials. The issue is not whether adults with "pediatric sarcomas" should be treated on pediatric trials. The issue is that patients should be treated on the best trials available. Some sarcomas are more common in young patients, such as rhabdomyosarcoma, Ewing sarcoma, and osteosarcoma. There is a long and largely successful tradition of clinical trials for these tumors in the pediatric oncology cooperative groups. The pediatric groups have learned to write protocols with no age requirement for eligibility. These trials are universally available to patients of any age. Are they appropriate for every patient? Clearly, the answer is no. Some older patients have other health problems such as heart or kidney disease that preclude administration of the drugs called for in these trials. These legitimate reasons to decline participation are addressed by eligibility requirements for minimal organ function, rather than an arbitrary age cutoff. Is it possible that a "pediatric" sarcoma arising in an adult is different from the same tumor arising in a child? Possibly. The best way to answer the question is to treat these two groups in the same way and look for differences in biological factors or outcomes which can be attributed exclusively to age. This is accomplished if adult patients take part in clinical trials alongside younger patients. This concept has a clear corollary. For sarcomas that are more common in adults, the expertise and the clinical trial experience has largely derived from the internal medicine, or adult cooperative groups. If a child develops a tumor that is more common in adults, we should be able to offer that child participation in a clinical trial appropriate for the diagnosis. Unfortunately, most internal medicine cooperative group trials are written with an age restriction excluding patients less than 18 years old. There is no biological basis for this exclusion and it should be discontinued. Participation of minors in clinical trials requires additional steps to obtain informed consent from the legal guardian and to document assent of the minor. The system we have in place for approval of new drugs in the United States makes a sharp distinction between adults and minors, and has often required a specific trial in children before drugs are allowed to be given to minors. The Sarcoma Alliance for Research through Collaboration (SARC) is a clinical trials group dedicated to seeking better treatments for patients with sarcomas. We have been successful in mounting clinical trials for sarcomas that improve access of all patients to appropriate therapies. We carried out a trial of imatinib for sarcomas other than GIST and we were able to open the trials to all patients 13 and older. We have worked with the FDA to develop new trials in which we have been able to use the same age criteria. Is there a need to test drugs specifically in children? Obviously there is a need for new agents to be tested in children to be sure that they do not negatively impact growth and development, specifically pediatric issues. But many clinical trials involve conventional agents that have already been tested in both age groups. There is no reason to include age as an entry criterion for any clinical trial. We should make the best therapy available to all. Dramatic progress has been made in the treatment of bone tumors over the last several decades in both the rates of survival and the quality of life of surviving patients. These improvements can be attributed to a variety of factors including identification of effective chemotherapy, improvements in surgical procedures and radiation delivery as well as improvements in supportive care, the recognition of the value and widespread utilization of multimodality therapy and a greater emphasis on multidisciplinary approaches to cancer care, among other reasons. Critical in making this progress, has been organized clinical trials, which have validated the efficacy of the various new modalities and approaches that have been incorporated into treatment and have defined what is now considered the standard of care. Clinical trials in bone tumors in North America have been conducted by a variety of institutions, multi-institutional groups and cooperative groups. The pediatric cooperative groups, the Children’s Cancer Study Group and the Pediatric Oncology Group, which have merged to form the Children’s Oncology Group, have been very active in studying bone tumors. Clinical trials participation is viewed as the standard of care by pediatric oncologists with over 90% of pediatric patients receiving their treatment as part of a clinical trial. This is in marked contrast to adult patients of which only a minority receive their treatment as part of clinical trials. This is believed by many to account in part for the improved outcomes of younger as compared to older oncology patients. It is important to note that in most Children’s Oncology trials in bone tumors participation is not limited to patients less than 18 or 21, the traditional separation between pediatric and adult services, with patients up to the third or fourth decade of life eligible for enrollment. The Children’s Oncology Group is not the only group involved in bone sarcoma clinical trials. The adult oncology cooperative groups, such as the South West Oncology Group, have sponsored clinical trials in this area. More recently several cooperative efforts more specifically focused on sarcoma clinical trials have begun to emerge. These include groups such as the Sarcoma Alliance for Research through Collaboration (SARC) consortium developed in association with the Connective Tissue Oncology Society (CTOS). As this clinical trials effort is a critical part of defining bone sarcoma standard of care and identifying new potentially effective therapies, this review will briefly describe the nature of clinical trials, review several completed clinical trials which have been critical in defining the present standard of care and discuss several clinical trials which are underway. The description of ongoing clinical trials can not be complete, nor is every patient appropriate for participation in a particular trial and therefore a treating oncologist is essential for identifying what or may not be appropriate for consideration. Clinical trials are generally described as being conducted in a series of phases, I through III. The various phases, represent in order, the steps that a new drug needs to take in order to become approved as a standard treatment. In general, from the standpoint of a patient, their interest would be best served by being treated in the opposite order of that taken by drugs, so that they receive the most proven therapy possible for their tumor. Therefore, in considering participation in a clinical trial, first preference would generally be given to a phase III study. Most phase III studies are performed in patients with newly diagnosed tumors, in which a standard treatment exists. Although study designs vary, in general, in a phase III study a randomized comparison is being made between treatment that is considered standard and an experimental arm which is hypothesized to be superior to that treatment. Although the experimental arm is hypothesized to be superior, that may not prove to be the case, hence the arms are viewed by the treating physicians as being equivalent. This equivalence is necessary to ethically be able to subject a patient to their treatment being decided randomly. In a well designed phase III study, the standard arm would be the treatment used by the majority of physicians for patients who did not elect to be part of the phase III study. The experimental arm would test something new and promising. In designing a clinical study the number of patients that will be permitted to participate is specified initially. The size of the study is defined so that it is likely to answer the question that is being asked. The parameters that influence the size of the study include the predicted outcome of the patients and the magnitude of the difference the intervention is believed possible of making, among others. The smaller the magnitude of difference anticipated, the larger the number of patients that are necessary for the clinical trial. In phase III studies a comparison is being made between a proven therapy and something which is postulated to provide an incremental benefit, hence by definition, the anticipated difference in outcomes for the treatment arms can not be large. Phase III studies therefore require large numbers of patients and because of the rarity of bone sarcomas necessitate their conduct as part of multi-institutional or cooperative groups over several years. Their performance in this manner mandates review by a large number of institutions and regulatory bodies, ensuring a high level of consideration of patient protection and safety. 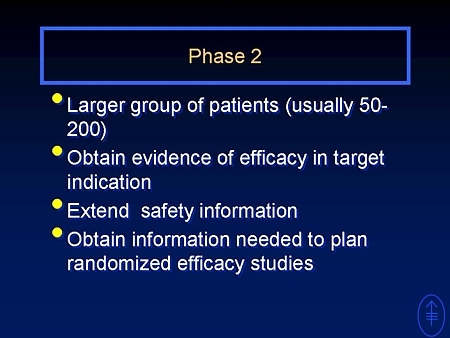 Phase II trials are intended to obtain information on the efficacy of a new agent or treatment regimen. Of the three phases of clinical trials the greatest variability exists in the design of phase II studies, as multiple approaches can be utilized to obtain information on efficacy. In the most traditional phase II study design, a new treatment is given as a single therapy to a patient for whom no standard therapy exists. Typically this occurs in the setting of diseases that have recurred after standard therapy. The lack of standard therapy makes use of novel agents or treatment approaches ethically acceptable providing a treatment option, that otherwise would not have existed. In this setting, patients typically have a poor prognosis and therefore the likelihood that a new agent will prove to be effective is low. Phase II trials are also performed of new treatment regimens to pilot their feasibility and obtain a preliminary estimate of their efficacy. These pilot studies can be performed in different patient groups and are conducted for a variety of reasons. Some pilot phase II studies are conducted to demonstrate the feasibility of a regimen that is believed to be more efficacious than standard therapy, in anticipation of it becoming the experimental arm of a phase III study. In many of these studies, standard therapy is felt in some way to be inadequate justifying the use of a new treatment approach. These pilot phase II studies may be conducted in newly diagnosed patients, sometimes selecting patient subgroups which may be anticipated to have a worse prognosis, such as those presenting with metastatic disease. Numerous other phase II trial designs exist including window studies and randomized trials, a full description of which would be beyond the scope possible in this review. As these studies typically are not comparing treatments, these studies are typically smaller and therefore can be performed by single institutions as well as larger groups. It is not uncommon that a single patient may be eligible for more than one phase II trial. Frequently little data exists to provide a rational basis for selecting treatment on a particular phase II trial over other phase II trials or standard therapy. A treating oncologist can usually obtain additional information from the physicians leading each of the clinical trials among other sources and therefore is an invaluable resource in making these decisions. Phase I trials are intended to demonstrate the safety of a new therapy or combination of therapies. These studies are virtually always performed in patients who have exhausted standard treatment options with alternatives to this therapy usually being other phase I trials or symptom directed care. Most phase I studies are performed with successive small groups of patients being treated at increasing doses to define what side effects occur and at what dose level. Given the nature of the patients being treated and that a proportion of patients will not be treated at the optimal dose of the new agent, the probability of having a response is relatively low, although a theoretical potential for benefit does exist. Similar to phase II trials, patients may be eligible for more than one trial and selecting between them is frequently difficult. Before the identification of effective chemotherapy, the only treatment available for osteosarcoma was surgery. Approximately 85 to 90% of patients who presented with only what appeared to be localized disease and underwent radical surgery, such as an amputation for an extremity lesion, rendering them grossly free of disease had recurrences of disease (1-3). This high probability demonstrates that the majority of patients with apparently localized disease have radiographically non-detectable metastases. Given this poor outcome, in the 1970’s several investigators reported using agents such as doxorubicin, cisplatin, high-dose methotrexate with leucovorin rescue, and ifosfamide and reported that chemotherapy had activity against osteosarcoma (4-14). All of these trials were non-randomized phase II treatments employing adjuvant chemotherapy, comparing results against historical control. Not all investigators were convinced that chemotherapy was appropriate for all patients, as these studies can be flawed. To clarify the issues surrounding the value of adjuvant chemotherapy, the Multi-Institution Osteosarcoma Study, a phase III randomized trial of chemotherapy versus observation alone, was initiated (15). Patients were eligible for study entry after tumor resection if they did not have clinically detectable metastatic disease. Patients who did not receive chemotherapy after surgery had a probability of disease free survival of 11% as compared to 66% for those who received chemotherapy unequivocally demonstrating chemotherapy was of benefit (15). Around the same time investigators introduced the concept of giving chemotherapy before carrying out definitive surgery on the primary tumor (16,17). This concept of induction chemotherapy arose from the need for time to make the custom endoprosthesis required for limb salvage procedures, creating an interval during which chemotherapy could be administered. In addition, theoretical advantages of chemotherapy prior to definitive surgery included early treatment of micro-metastatic disease and facilitation of the eventual surgical procedure. It also became possible to examine the histologic response of the tumor to this initial period of chemotherapy to assess the effectiveness of therapy. A strong correlation between the degree of necrosis observed in the tumor at the time of definitive surgery and the probability of subsequent disease free survival was observed which has been confirmed in multiple clinical trials (16-21). Numerous trials have been conducted to clarify the role of the various chemotherapeutic agents and approaches in the treatment of osteosarcoma. Not all of these trials can be reviewed, but the most recently published North American phase III study performed by the Children’s Oncology Group will be briefly described. This study addressed the questions of whether the addition of ifosfamide and/or muramyl tripeptide – phosphatidyl ethanolamine to the three other agents used in the standard treatment of osteosarcoma (doxorubicin, cisplatin, and high dose methotrexate) would improve the probability of disease free survival. This study unfortunately produced confusing results showing when combined with standard therapy no improvement with either agent alone but some benefit when the two were used together (21). This suggested an interaction may have been occurring between these two experimental agents, which had not been expected at trial initiation and therefore will require further study to properly interpret the results. Until this confusion is resolved standard therapy for newly diagnosed osteosarcoma remains a three drug regimen comprised typically of cisplatin, doxorubicin and high dose methotrexate both preceding and following definitive surgery. In osteosarcoma although patients presenting with metastatic disease have a worse prognosis, the principles of therapy, including the chemotherapy are generally the same. Similar to what is described for osteosarcoma the survival of patients with Ewing Sarcoma Family Tumors (ESFT) prior to chemotherapy was poor; with studies reporting a 5-year survival of 10%. Options for local control for ESFT includes both radiation therapy and surgery, a discussion of which is beyond the scope of this review. The first chemotherapeutic agents shown to be effective in ESFT were cyclophosphamide, actinomycin-D, and vincristine, with these agents used individually in the early 1960s and in combination by the late 1960s. The majority of prospective, randomized phase III clinical trials in ESFT in North America were conducted as Intergroup Ewing Sarcoma Studies by the Children’s Cancer Group and Pediatric Oncology Group beginning in 1973. Numerous important findings were made in these studies including the identification of high risk subgroups of patients including those with large and pelvic primaries, and the additional optimization of the chemotherapy regimens (22,23). The last published phase III study from this group randomized patients to receive standard chemotherapy with doxorubicin, vincristine, cyclophosphamide and dactinomycin to those four dugs along with courses of ifosfamide and etoposide. The experimental arm significantly enhanced the survival of patients with apparently localized ESFT (24). Hence; standard chemotherapy for patients with localized ESFT would be comprised of a regimen comprised of vincristine, cyclophosphamide, doxorubicin, dactinomycin, ifosfamide and etoposide. Unfortunately in patients presenting with metastatic disease the experimental arm did not improve the known poor prognosis of this subgroup of patients. In ESFT a series of phase II trials have been reported using high dose chemotherapy followed by autologous stem cell transplant (bone marrow or peripheral stem cells) for patients with recurrent and/or metastatic disease in an attempt to improve upon the poor outcomes (25,26). These studies were driven by the hypothesis that the dose response curves for ESFT cells is very steep, and that, therefore, increasing the dose of these agents would kill adequate numbers of ESFT cells to ensure patient survival. In this strategy the high dose chemotherapy is the therapeutic portion of the treatment and the autologous stem cell (bone marrow or peripheral stem cells) transplant is merely a means of rescuing the patient from the toxic effects of the treatment. Without stem cell rescue with the doses of chemotherapy and/or radiation typically employed in these regimens the patients bone marrow would become aplastic and they would not survive. It may be worthwhile to note that this strategy generally has not been utilized in osteosarcoma because the chemotherapy that is most effective in this disease, does not have myelosuppression as its major side effect and bone marrow transplantation would therefore not allow higher dosing than used routinely. These phase II studies in ESFT demonstrated the feasibility of high dose regimens requiring stem cell support despite being associated with significant toxicity. However, the impact of these regimens upon improving outcome have been very mixed and controversial (25-27). A significant lag exists between the completion of a clinical study and its publication. Some of this lag is necessary so that patient outcomes are sufficiently mature so that confidence exists in the data. Others are a result of other lags such as the time to produce a manuscript, have it accepted by a medical journal and published, among others. Preliminary results are frequently presented at Scientific Meetings prior to their publication to disseminate the information to the medical community. Treating oncologists are a valuable resource for access to this information. Other studies that have been completed by the Children’s Oncology Group but have not been published include the following: a series of pilot phase II studies investigating intensifying doxorubicin with dexrazoxane, ifosfamide/etoposide or both to patients with newly diagnosed osteogenic sarcoma, a phase II study of trastuzumab (Herceptin®) along with standard chemotherapy to patients with newly diagnosed metastatic osteosarcoma, a phase III randomized study of a 30-week dose intensive regimen of alkylators to the previous 48 week regimen in ESFT and a phase III randomized study in ESFT of compressing the time between chemotherapy cycles to two weeks. For some of these studies the results have been presented at scientific meetings but none will be described in detail in this review, as these trials are neither available for participation nor to this point of time have they defined a new standard of care. Perhaps the most important issue being discussed is ongoing clinical trials. Although they do not define care at present, the majority of these studies are active and patients meeting specific criteria can be enrolled in them. This review can not cover all of the active trials and will discuss only selected studies. One of the best resources for identifying clinical trials in oncology in North America is a website directory of active clinical trials maintained by the National Cancer Institute. This website lists trials from cooperative groups as well as institutions, and by nature of its government affiliation is relatively unbiased. At present the website list approximately thirty osteosarcoma therapeutic studies and about thirty ESFT therapeutic studies. Representative studies for the treatment of osteosarcoma are presented in Table 1 and for ESFT in Table 2. Several of these studies will be discussed briefly in the subsequent section. Please check our Clinical Trials Resources for a listing of clinical trial websites and organizations. The difficulty in describing ongoing clinical trials, particularly for the Phase I and II studies, is their availability changes rapidly and information frequently is relevant only for limited periods of time. Therefore the descriptions of the individual studies will be kept very brief. In osteosarcoma, the Children’s Oncology Group has just embarked on a phase III randomized trial for patients with newly diagnosed localized osteosarcoma. This study will be conducted throughout North America and in collaboration with European Clinical Trials Groups. Patients up until the age of 40 are permitted to participate. All patients will receive the same therapy prior to definitive surgery. Following this therapy post-operative chemotherapy will be based on the histological response observed at the time of definitive surgery. Patients with a greater degree of necrosis will be randomized to standard therapy (cisplatin, doxorubicin, methotrexate) with/or without pegylated interferon. Patients with an inferior degree of necrosis will be randomized to standard therapy with/or without high-dose ifosfamide and etoposide. These studies are intended to definitively establish the relative merit of the experimental versus standard treatment arms. A number of institutions and groups are exploring new treatment options for patients with recurrent osteosarcoma in phase II and I studies. Of particular interest is developing targeted therapies which are more selectively directed towards osteosarcoma than present treatments with their significant side effects. In some tumors this has been achieved by identifying agents that target molecular alterations exclusively present in the tumors. Thus far, this has been elusive for osteosarcoma. An alternative means of targeting tumors is to deliver the anti-cancer agent selectively to the site where it resides. In osteosarcoma the vast majority of metastatic disease appears in the lungs, with other bones being a much rarer metastatic site. Therapy is therefore being developed to specifically accumulate in the lungs or bones. To have drug preferentially accumulate in the lungs, the chemotherapy can be given as an aerosol. This will result in a higher concentration in the lungs than in the systemic circulation. This approach is being used to deliver a cytokine as part of a Children’s Oncology Group trial and cisplatin encapsulated in a liposome as part of a trial at the Children’s Hospital at Montefiore. Similarly a bone seeking isotope, samarium, is being used to selectively deliver radiation to bone metastases as a part of a trial being conducted at the John’s Hopkins Medical Center. Numerous other chemotherapy trials are being conducted in osteosarcoma of a variety of agents with a partial list summarized in Table 1. The Children’s Oncology Group for patients with ESFT presenting with lung metastases is collaborating with the European Cooperative groups, as they are for osteosarcoma, in performing a Phase III trial. This trial is intended to more definitively address whether patients with ESFT presenting with metastases benefit from high dose chemotherapy with stem cell rescue. The patients treated on this trial all receive standard chemotherapy which is followed by a randomization to high dose chemotherapy with stem cell transplant versus continuation chemotherapy. This trial should help clarify the potential benefit of high dose chemotherapy with stem cell rescue approaches for high risk ESFT. One of the innovative phase II trials being conducted for recurrent ESFT is a study of transplant re-infusing stem cells from a donor rather than the patient, being conducted at the National Cancer Institute. This approach has several potential advantages. One potential cause of relapse following use of the patient’s stem cells is contamination of the stem cells themselves with tumor cells because ESFT can metastasize to that site. Use of donor cells avoids that risk. More importantly, engrafted stem cells from a donor will form the patient’s immune system. Use of stem cells from a donor enhances the likelihood that the patient’s newly reconstituted immune system will recognize residual ESFT cells, if they exist, as foreign and kill them. Hence, the stem cells themselves in this transplant may be therapeutic. Balancing these potential benefits, stem cell transplantation from a donor is associated with much greater risk than an autologous procedure. This trial will begin to provide evidence of the potential benefits of this treatment strategy. Numerous other chemotherapy trials are being conducted in ESFT of a variety of agents with a partial list summarized in Table 2. In this review, the various phases of clinical trials have been described. The progress that has been made in osteosarcoma and ESFT through chemotherapy clinical trials was described. The progress has been significant with these studies defining the present standard of care. Several ongoing trials were briefly described. All patients with osteosarcoma and ESFT should consider participation in a clinical trial if they are eligible. Resources exist for helping a patient identify active oncology clinical trials. Additional information can be provided, on these and other studies, by treating oncologists that can help to determine which if any trial should be considered for participation. 1. Marcove RC, Mike V, Hajek JV, et al. Osteogenic sarcoma under the age of twenty-one. A review of 145 operative cases. J Bone Joint Surg [Am] 1970;52:411-423. 2. Gehan EA, Sutow WW, Uribe-Botero G, et al. Osteosarcoma: The M.D. Anderson experience, 1950-1974. Prog Cancer Res Ther 1978;6:271-282. 3. Uribe-Botero G, Russell W, Sutow W, Martin R. Primary osteosarcoma of bone: A clinicopathologic investigation of 243 cases, with necropsy studies in 54. Am J Clin Pathol 1977;67:427-435. 4. Cortes EP, Holland JF, Wang JJ, Sinks LF. Doxorubicin in disseminated osteosarcoma. JAMA 1972;221:1132-1138. 5. Jaffe N, Farber S, Traggis D, et al. Favorable response of metastatic osteogenic sarcoma to pulse high dose methotrexate with citrovorum rescue and radiation therapy. Cancer 1973;31:1367-1373. 6. Pratt C, Howarth C, Ransom J, et al. High dose methotrexate used alone and in combination for measurable primary and metastatic osteosarcoma. Cancer Treat Rep 1980;64:11-20. 7. Nitschke R, Starling KA, Vats T, Bryan H. Cis-diamminedichloroplatinum (NSC-119875) in childhood malignancies: A Southwest Oncology Group Study. Med Pediatr Oncol 1978;4:127-132. 8. Baum ES, Gaynon P, Greenberg L, et al. Phase II study of cis-dichlorodiammineplatinum (II) in childhood osteosarcoma: Children's Cancer Study Group Report. Cancer Treat Rep 1979;63:1621-1627. 9. Marti C, Kroner T, Remagen W, et al. High-dose ifosfamide in advanced osteosarcoma. Cancer Treat Rep 1985;69:115-117. 10. Jaffe N, Frei E, Traggis D, Bishop Y. Adjuvant methotrexate and citrovorum-factor treatment of osteogenic sarcoma. N Engl J Med 1974;291:994-997. 11. Cortes EP, Holland JF, Glidewell O. Adjuvant therapy of operable primary osteosarcoma--Cancer and Leukemia Group B experience. Rec Results Cancer Res 1979;68:16-24. 12. Goorin A, Delorey M, Gelber R, et al. 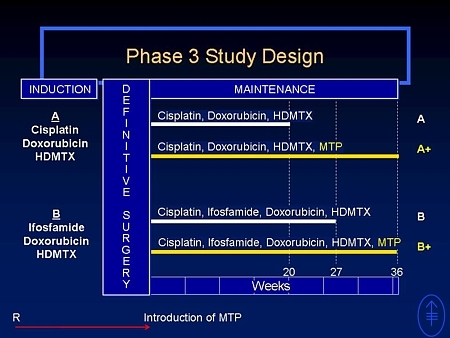 The Dana-Farber Cancer Institute/The Children's Hospital adjuvant chemotherapy trials for osteosarcoma: Three sequential studies. Cancer Treat Rep 1986;3:155-159. 13. Sutow WW, Sullivan MP, Fernbach DJ, et al. Adjuvant chemotherapy in primary treatment of osteogenic sarcoma. A Southwest Oncology Group Study. Cancer 1975;36:1598-1602. 14. Sutow WW, Gehan EA, Dyment PG, et al. Multidrug adjuvant chemotherapy for osteosarcoma: Interim report of the Southwest Oncology Group Studies. Cancer Treat Rep 1978;62:265-269. 15. Link MP, Goorin AM, Miser AW, et al. The effect of adjuvant chemotherapy on relapse-free survival in patients with osteosarcoma of the extremity. N Engl J Med 1986;314:1600-1606. 16. Rosen G, Marcove RC, Caparros B, et al. Primary osteogenic sarcoma. The rationale for preoperative chemotherapy and delayed surgery. Cancer 1979;43:2163-2177. 17. Winkler K, Beron G, Kotz R, et al. Neoadjuvant chemotherapy for osteogenic sarcoma: Results of a Cooperative German/Austrian Study. J Clin Oncol 1984;2:617-624. 18. Rosen G, Murphy ML, Huvos AG, et al. Chemotherapy, en bloc resection, and prosthetic bone replacement in the treatment of osteogenic sarcoma. Cancer 1976;37:1-11. 19. Bacci G, Picci P, Ruggieri P, et al. Primary chemotherapy and delayed surgery (neoadjuvant chemotherapy) for osteosarcoma of the extremities. The Instituto Rizzoli experience in 127 patients treated preoperatively with intravenous methotrexate (high versus moderate doses) and intraarterial cisplatin. Cancer 1990;65:2539-2553. 20. Provisor AJ, Ettinger LJ, Nachman JB, et al. Treatment of nonmetastatic osteosarcoma of the extremity with preoperative and postoperative chemotherapy: A report from the Children's Cancer Group. J Clin Oncol 1997;15:76-84. 21. Meyers PA, Schwartz CL, Krailo ML, et al. Osteosarcoma: a randomized, prospective trial of the addition of ifosfamide and/or muramyl tripeptide to cisplatin, doxorubicin and high-dose methotrexate. J Clin Oncol 2005:23:2004-2011. 22. Nesbit ME, Gehan EA, Burgert EO, et al. Multimodal therapy for the management of primary, nonmetastatic Ewing's sarcoma of bone: a long-term follow-up of the First Intergroup study. J Clin Oncol 1990;8:1664-1674. 23. Evans RG, Nesbit ME, Gehan EA, et al. Multimodal therapy for the management of localized Ewing's sarcoma of pelvic and sacral bones: A report from the second intergroup study. J Clin Oncol 1991;9:1173-1180. 24. Grier HE, Krailo MD, Tarbell NJ, et al: Addition of ifosfamide and etoposide to standard chemotherapy for Ewing’s Sarcoma and primitive neuroectodermal tumor of bone. N Engl J Med 2003;348:694-701. 25. Pinkerton CR, Bataillard A, Guillo S, Oberlin O, Fervers B, Philip T. Treatment strategies for metastatic Ewing's sarcoma. Eur J Cancer 2001;37:1338-1344. 26. Hawkins D, Barnett T, Bensinger W, Gooley T, Sanders J. Busulfan, melphalan, and thiotepa with or without total marrow irradiation with hematopoietic stem cell rescue for poor-risk Ewing- Sarcoma-Family tumors. Med Pediatr Oncol 2000;34: 328-337. 27. Kushner BH, Meyers PA. How effective is dose-intensive/myeloablative therapy against Ewing's sarcoma/primitive neuroectodermal tumor metastatic to bone or bone marrow? The Memorial Sloan-Kettering experience and a literature review. J Clin Oncol 2001;19:870-880. V3N2 ESUN. Copyright © 2006 Liddy Shriver Sarcoma Initiative. Editor's Note: Dr. Meyers gave the Nina Axelrad Lecture at the CTOS 14th Annual Meeting in London, United Kingdom in November 2008. The article which follows is a transcription of that talk. Dr. Meyers took an opportunity to modify some of the material after the presentation. We are very grateful to Dr. Meyers for sharing this talk with the ESUN community. The addition of chemotherapy to the treatment of "pediatric sarcomas" transformed lethal diseases into treatable diseases. We have not seen similar benefits for the addition of chemotherapy to surgery and radiation therapy for the treatment of most soft tissue sarcomas seen in adults. In addition, we have seen a plateau in our ability to improve outcome for the "pediatric" sarcomas, with little or no improvement in outcome in recent years. All of us are excited by the possibility of biological or targeted therapies. We face an enormous challenge designing appropriate clinical trials to evaluate new agents which have biological targets. When biological agents demonstrate promise in pre-clinical or early phase clinical testing, we will need to consider how best to introduce these agents in the treatment of sarcomas. 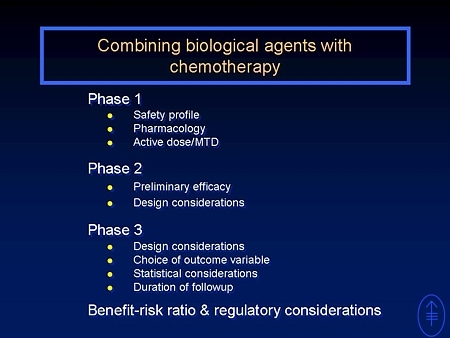 For diseases in which chemotherapy has an unequivocal benefit we will face the additional challenge of learning how to combine biological agents most effectively and safely with chemotherapy. I would like to present my thoughts about some of the issues that arise as we consider how to move biological agents forward into our armamentarium of treatment for sarcomas. Goals of early studies are to obtain pharmacology information about the agent to determine dose ranges appropriate for future studies and to establish toxicity profiles, with starting doses usually based on preclinical toxicology studies. 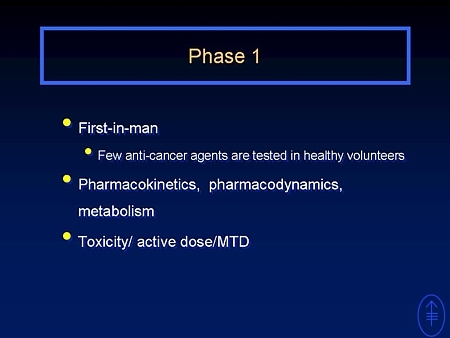 However, few anti cancer agents are tested in true phase 1 studies in healthy adults. Rather, most anticancer agents are tested in early studies in patients with advanced cancers where, unlike studies in healthy subjects, the intent is to avoid pharmacologically inactive doses. It is worth noting that MTP is so safe that we have been able to administer it to normal volunteers. Most early studies with biologics as with other anticancer agents have been conducted in patients with late stage cancer. Do we expect the agent to have an impact on bulky tumors? The example of Imatinib in GIST suggests that some biological agents will be useful in the setting of macroscopic disease. Other agents seem much less likely to work against bulk disease and will have a greater chance to demonstrate efficacy in the adjuvant setting. To some extent we will make this prediction based on the proposed mechanism of action of the biological agent. This information is important in order to set realistic expectations of agents in these early studies. Especially in the absence of treatment effects, early goals focus on identification of a pharmacologically effective dose or optimal biologic dose rather than maximally tolerated dose (MTD) and biologically active doses may occur well below the MTD. Pharmacologic or biologic activity may be assessed by a variety of means including laboratory and clinical changes that are indicative of in vivo activity. For MTP evidence of biologic activity in early studies included induction of tumoricidal macrophages, increases in serum cytokines and -the so-called ‘cytokine flu’, including fever, chills and headache. There was anecdotal evidence of antitumor activity in these early studies of late stage patients but no patterns emerged. The MTD was established with the usual criteria of toxicity. We chose a dosing schedule below the MTD because it was associated with evidence of biological activity with a very low rate of grade 3 and 4 toxicities. There are a number of new monoclonal antibodies against the IGF1 receptor which inhibit the IGF pathway. 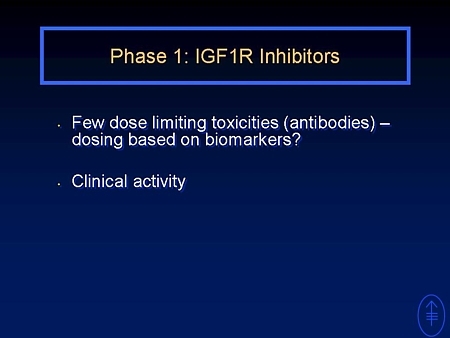 In the absence of dose limiting toxicities, potential biomarkers for IGF receptor inhibitors include down regulation of IGF 1R, upregulation of the ligands IGF1 and IGF2, reduction in circulating tumor cells, changes in the phosphorylation status of the receptor, receptor occupancy or other mechanism-related toxicities such as hyperglycemia. 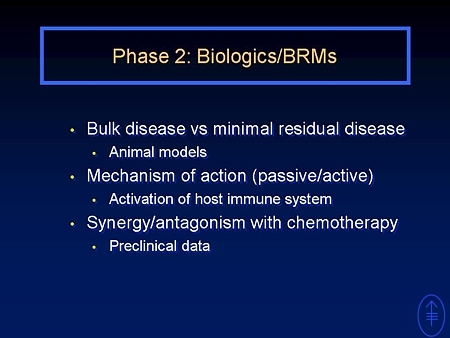 We need to think hard about how we plan to incorporate these agents into clinical trials for sarcomas. We know that we have seen objective responses in a sub set of patients with recurrent sarcomas, including some patients with Ewing sarcoma and osteosarcoma. Phase 2 studies should be designed to provide the information and confidence that we need to take an agent into large randomized phase 3 studies. Thus from Phase 2 studies we need to obtain sufficient efficacy information to have confidence of the drug’s potential and to estimate the treatment effect we would plan into the phase 3 design. Phase 2 should also further extend the safety profile of the agent to help to determine what might be key safety issues in larger studies. Phase 2 studies may be single arm or randomized, though randomized phase 3 studies typically provide a better estimate of potential treatment effects. As we consider our design of phase II trials of biological agents, we must consider the proposed mechanism of action and the likelihood of an objective response. For some biological agents it is more likely that we will expect to see benefit when they are employed against microscopic sub-clinical disease than when they are applied to bulky tumors. For these agents, it makes more sense to achieve a state of minimal disease by surgical resection of bulky disease and then administer a new agent in the adjuvant setting. This is a different paradigm from the conventional phase II design which seeks to demonstrate an objective response in measurable tumor lesions. This requires the use of different end points to assay the effect of anti-tumor agents. This will require the use of progression free survival or overall survival, not objective response to demonstrate the activity of an agent. The expectation, especially for agents that work by activation of the host immune system or host cytokines, is that they will be more likely to demonstrate clinical activity in minimal residual disease, especially since the immune system is often compromised in patients with late stage or bulky disease. This has been demonstrated in many animal models for such agents. We will also need to consider whether we believe that an agent will exert the greatest effect as a single agent or when given together with other tumor agents, such as chemotherapy. If a novel agent is likely to exhibit synergy with chemotherapy, the best way to detect that benefit is in a phase II trial of the new agent in combination with chemotherapy. We will need to be guided by pre-clinical studies to make these decisions. Finally, we should consider the natural history of the tumor we hope to treat. For tumors which progress or recur relatively quickly, delaying introduction of a new agent until after completion of conventional therapy will almost certainly be too late to have a major impact on outcome. Based on the results of MTP in dogs, we thought the best chance to demonstrate anti-tumor activity for this new agent was in osteosarcoma. As we considered the development of MTP, we reasoned that it was unlikely to show marked benefit in the setting of bulky disease. This is a function both of the nature of osteosarcoma, which secretes osteoid and ossifies that matrix, and of data from the preclinical studies of MTP. The initial phase 2 study of MTP in osteosarcoma performed at the MD Anderson included patients with relapsed pulmonary disease who were rendered disease free by surgery then received single agent therapy. This allowed the agent to be tested in a setting of minimal residual disease but without denying any patient standard of care, since complete surgical excision is the only proven post-relapse treatment with important influence on patient outcome. This study demonstrated benefit of MTP compared to a matched group of historic controls, provided information on the importance of duration of treatment, and evidence of an in vivo effect of MTP in the tumor. Evidence of the activity of biologic agents that can be obtained from direct observation of tumor tissue is an important piece of information that should not be overlooked while performing early phase studies. In the case of agents like MTP, which depend upon activation of the host immune system or cytokines for anti-tumor activity, evidence of such activation in the tumor can provide strong support for the activity of the agent. Chemotherapy is an essential part of the treatment strategy for newly diagnosed patients with osteosarcoma. As we considered how to introduce MTP into phase III trials for the treatment of osteosarcoma, we had to decide whether the drug should be given with chemotherapy. Early preclinical work by Drs Fidler and Kleinerman had suggested that MTP worked through activation of macrophages to become tumoricidal in the autologous setting. If MTP works through effector cells, administration with chemotherapy might be ineffective, since chemotherapy will decrease the numbers of effector cells. While the number of circulating macrophages is certainly decreased by chemotherapy, we had information that tissue fixed macrophages, especially in the lung, survived systemic chemotherapy and even survived cytoreduction and allogeneic BMT. Since the lung is the primary site of metastasis for 85% of patients following treatment for osteosarcoma, we felt that there would be adequate effector cells to respond to MTP. In this case, MTP should be introduced with chemotherapy. More recently Dr Kleinerman has demonstrated that activation of the fas/fas ligand apoptotic pathway may one mechanism by which MTP is effective. If MTP works by activating an apoptotic pathway it might be synergistic with chemotherapy. In this case, too, MTP should be introduced with chemotherapy. In preparation for a study using the combination, we needed data about the feasibility and safety of combining MTP with the chemotherapy agents commonly used to treat osteosarcoma. 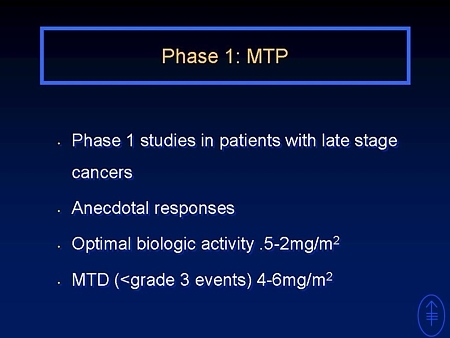 We knew from phase I studies that MTP had a very benign toxicity profile. In 1991, we designed a phase II randomized adjuvant therapy trial for osteosarcoma using ifosfamide with and without MTP following resection of recurrent pulmonary nodules. The outcome variable was progression free survival. The sponsor felt that the FDA would not recognized PFS as a valid end-point and declined our study design. Dr Kleinerman and I performed a small trial of ifosfamide and MTP in recurrent osteosarcoma and demonstrated that the safety profile of both agents remained unchanged, and cytokine activation associated with MTP was unchanged when it was administered in combination with chemotherapy. This trial was designed to detect negative impacts of each on the other. One lesson that I take from this experience is that it would have been better to carry out the randomized adjuvant phase II study. Pre-clinical studies of IGF1R inhibitors have suggested synergy between chemotherapy and IGF pathway inhibition. As we design our phase II studies for these monoclonal antibodies, the same considerations arise. We have observed an extremely favorable toxicity profile for this class of agents. Early data suggest that combination of anti-IGF1R monoclonal antibodies with chemotherapy does not worsen toxicity. 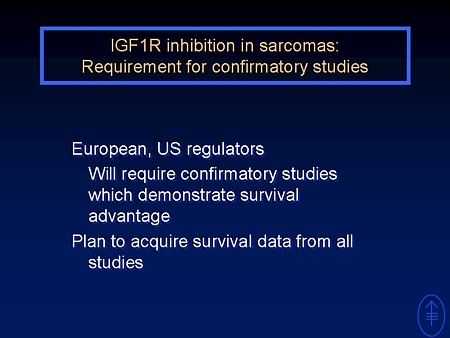 While further single agent studies with anti-IG 1R monoclonal antibodies may not be necessary to gather further safety data, we will need to design phase II trials of these monoclonal antibodies in combination with the agents we commonly use to treat sarcomas. My experience suggests that these would be best designed as randomized studies. End-points for these trials should include objective response, progression free survival and especially in randomized trials, overall survival. We must be vigilant about regulatory considerations as we design these studies. We have been told on both sides of the Atlantic that the regulators will regard PFS analyses as surrogates that will require confirmatory trials. If we are planning phase 3 studies, surrogate endpoints may be acceptable for phase 2 studies, but should the data from randomized Phase 2 be sufficiently convincing, we would certainly want to be able to use it to support approval. Therefore, we must design every phase II trial to capture overall survival as an end-point in addition to the more conventional endpoints of objective response and progression free survival. This is a major shift in the way we have approached phase II clinical trials, and will require significantly longer follow-up after study enrollment than the much easier endpoints, but this will be essential if phase 2 data will contribute to the regulatory approval that will make these agents available to our patients. The goal of phase 3 studies is to confirm the efficacy seen in phase 2 studies and draw conclusions about the benefit – risk ratio of a drug for the treatment of a specific disease in a specific population. 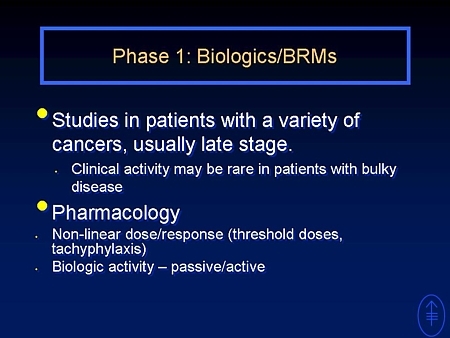 As mentioned above, design considerations may be unique for biologics and biological response modifiers (BRMs) in terms of when we give them, what we give them with and how we evaluate them best. The following slides illustrate the factors we considered in designing the phase 3 study of MTP and factors we should consider in designing such studies of IGFR inhibitors. We saw in our small phase 2 study that MTP could be given with chemotherapy without negative impact on the immune activation by MTP nor on the chemotherapy effects on the tumor. All preclinical and clinical data had suggested that MTP would work best in the setting of minimal residual disease. For this reason we decided that it would be optimal to delay introduction of MTP until after surgical resection of clinically detectable macroscopic disease. In osteosarcoma we detect progression or recurrence when macroscopic metastatic nodules, most commonly in the lung, are detected by imaging studies. The appearance of a metastatic nodule in the lung reflects development of a recurrent clone of tumor cells months earlier. The pattern of failure of osteosarcoma suggested that if we waited until completion of all planned chemotherapy to introduce a new agent we would have "lost" one-third to one-half of the patients destined to relapse before we could even introduce the new agent,. Thus after consideration of the results of early phase clinical trials, consideration of the possible mechanism of action of MTP, and consideration of the pattern of failure of osteosarcoma with chemotherapy alone, we decided to introduce the biological agent immediately after surgery at the same time that chemotherapy was resumed. The rationale for introducing MTP as early as possible after surgery is illustrated by this Kaplan-Meier plot of the survival and event free survival for patients with localized osteosarcoma treated on INT 0133. Note that the development of macroscopic tumor recurrence, which reflects an event months earlier, occurs relative frequently during the early period of treatment and delaying the introduction of a new agent until nine months after diagnosis would lose a significant fraction of patients before the agent could be introduced. We attempted to hedge our bets by continuing the administration of MTP after the completion of adjuvant chemotherapy so that there would also be a period of time when MTP was administered without concomitant chemotherapy. This decision led to a gap shown on this slide in red between the randomization of patients to one of the four treatment regimens and the introduction of the investigational agent approximately 3 months later. This allowed an imbalance in the treatment arms in the response to neoadjuvant chemotherapy, which is usually seen as an important predictor of outcome and which I will address again later. Of note, the current EURAMOS study randomizes patients after surgery and when the response to neoadjuvant chemotherapy is known, thus should avoid such imbalance. Also worth mentioning, however, is that 30% of the patients in the EURAMOS trial are currently not being randomized at the later time point because of patient or investigator unwillingness to accept randomization. As we carry out phase II trials of inhibition of the IGF pathway, both single agent and in combination with chemotherapy, we should be considering how we will want to design the phase III trials of these agents. We have seen objective responses in sarcomas using anti-IGF pathway monoclonal antibodies, although the response rates are not high. We have pre-clinical evidence for synergy with chemotherapy. This suggests that we should introduce IGF inhibition and chemotherapy concurrently. Concurrent administration would also obviate the problem of delayed randomization. Just as we continue adjuvant chemotherapy after resection or radiation of primary sarcomas to treat microscopic disease, we will want to continue IGF pathway inhibition. Given the extremely favorable toxicity profile of the anti-IGF MoAbs, we may want to continue these agents even beyond the planned termination of chemotherapy, as maintenance therapy for sarcomas in remission. Of course statistical considerations are critical in the design of randomized trials, especially those intended to support approval for use. Overall survival is the gold standard in oncology trials. We will absolutely need to design these trials to capture overall survival as well as EFS, and this will require that these studies remain open and active to accrue information about patient vital status much longer than our usual practice. While there are many phase 3 designs that should be considered when planning a study, I would like to spend a few minutes on a complex approach that is especially appealing in studies of indications with small patient populations – the factorial design – and its benefits and challenges. The use of a factorial design in a clinical trial is a strategy to answer more than one question with a cohort of patients. The intent of a factorial trial is to analyze the contribution of each factor by marginal analysis. This means that we estimate the effect of factor B while ignoring factor A. If there is no interaction between factor A and factor B, then the effect of factor B will be similar within each level (present/absent) of factor A. The design is based on the assumption that there is no interaction between the two different interventions. It is a widely accepted statistical principle that the test of the hypothesis of no interaction should have a p-value greater than 10% in order to conclude that there is no significant interaction. This rule is more stringent than the 5% threshold we commonly employ for most statistical tests in clinical trials. To conduct a clinical trial to prove that there is no interaction would be very difficult. Just as a clinical trial to demonstrate equivalence of 2 interventions requires a much larger sample size than a trial to detect a difference between the 2 interventions, a trial to prove no interaction would require a much larger sample size than a trial to detect an interaction. 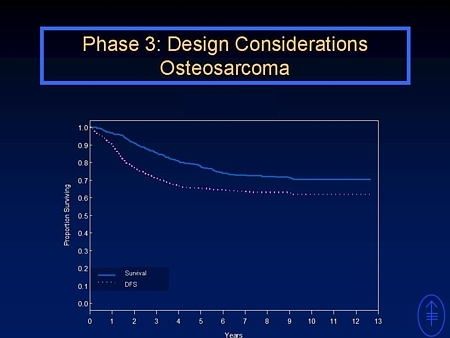 For designing the phase 3 MTP study in osteosarcoma, we considered that our history had been to conduct one large prospective randomized trial each decade for osteosarcoma. It is worth noting that that history has been validated by subsequent events in the osteosarcoma clinical research community. If we designed a trial to answer a single question, we would not have the opportunity to ask another question for a decade. Thus we designed a factorial trial with two questions. The first question was whether the use of ifosfamide would improve outcome. At the time we designed the study, there was intense interest in the use of ifosfamide for the treatment of osteosarcoma. Several studies had demonstrated the activity of ifosfamide against OS, both in recurrent disease and in newly diagnosed patients with metastatic disease. There was a widely held presumption that the addition of ifosfamide to the treatment of osteosarcoma would result in improved outcome. In addition, a large study had suggested that multi-drug resistance (mdr) played a role in osteosarcoma resistance to chemotherapy and ifosfamide is not an mdr substrate. By designing the trial as a substitution trial in the induction phase, we hoped to compare ifosfamide to cisplatin using tumor necrosis as an endpoint. The second question was whether the addition of MTP to maintenance chemotherapy would improve the outcome. It is worth spending a moment to examine the relationship between sample size and population size and the impact that this relationship has on estimates of error. This is an important issue when we enter into discussion with regulators about the need for a confirmatory trial. Imagine a large jar which contains 1,000 marbles, 700 red and 300 blue. I chose 70% for this example to simulate the a priori EFS we predicted for patients with localized osteosarcoma in our prospective trial. If we remove a sample of 50 marbles from the jar, we anticipate a mean of 35 red and 15 blue marbles, the same 70% as the population, but the standard error of the mean is large, 6.3%. If we begin with the same population, but take a much larger sample, 500 marbles, the standard error of the mean is much smaller. In our phase III prospective randomized trial of the effect of MTP for the treatment of osteosarcoma we enrolled 777 patients in 4 years. We estimate the incidence of pediatric osteosarcoma in North America at 350-400 patients each year. This means that we enrolled roughly half of the pediatric population of patients with osteosarcoma in this clinical trial. Our estimate of effect size are robust, with much smaller errors, than we would see with a smaller sample size. For comparison, a similarly powered trial in breast cancer would have enrolled over 200,000 subjects. In large scale phase III clinical trials, we perform interim analyses to monitor the safety of subjects in the clinical trial. We want to be sure that we do not subject patient subjects to unexpected or unacceptable toxicity. We want to be sure that we monitor study progression for differences in therapeutic assignment. If one arm of a study is clearly superior, continuation of the study would continue assignment of patient subjects to an inferior treatment. But we must be vigilant to perform analyses at pre-determined points. If we look at the data prior to the final analysis, we need to adjust the statistical test we use to conclude that we have identified differences between study arms. During the time this trial was accruing patients, NCI implemented requirements that the Cancer Cooperative Groups, including POG and CCG, increase the rigor of the data monitoring committees and implement formal interim analysis plans. Therefore, while the interim analysis plan for this study was implemented following the initiation of the trial, the reason for the implementation was not related to inspection of accruing results. Furthermore, the specific details of the interim analysis plan were not the result of having inspected the data (Mark Krailo, personal communication). The analyses were performed at predetermined intervals and included assessment of futility or highly significant differences that might suggest ending the study early. None of the analyses demonstrated results that crossed a monitoring boundary for either the chemotherapy or MTP intervention. In addition, a proportional hazards regression model was used to assess interaction between the chemotherapy and MTP therapy; the interaction was not significant in any of the analyses. At the time we published our first analysis of the outcome of this study, we had not observed enough deaths to activate an analysis of overall survival. There were no interim analyses of overall survival, thus no adjustment for significance is required of our final survival analysis. The choice of outcome variable or end point is a crucial decision in clinical trial design. Many of our current trials for the treatment of sarcomas use an end point of progression free survival. For newly diagnosed patients we more commonly use event free survival. Many trials in adult cancers employ median survival as a composite measure. For disease where EFS or survival exceeds 50%, median survival is a meaningless term. We have employed 80th percentile survival in some analyses. As I will discuss, overall survival and quality of life are considered the most robust outcome measures and have been preferred endpoints for regulatory approvals. The NCI has published its position on the relative strength of endpoints from clinical trials. There is a clear hierarchy of study design, with the randomized controlled clinical trial at the top of the list, and double-blind trial design preferred to open-label trials. In terms of endpoints, the NCI position places overall mortality at the top of the list, and considers all the more commonly used endpoints, including EFS, DFS, PFS, and response, to be inferior measures to indicate the efficacy of treatment. The FDA convened an expert panel to develop guidelines for the development of new agents in pediatric oncology. The consensus position was that surrogate markers such as PFS and EFS may be used as early means to identify efficacy, but the use of these surrogate markers requires validation and correlation with clinical benefit. Progression free survival is widely employed in assessing the impact of new agents in recurrent sarcoma. It allows the evaluation of agents in disease states where we cannot achieve a complete remission or minimal residual disease. We believe that prolongation of PFS is a measure of clinical benefit. The information is available quickly. We use it much less commonly in trials of newly diagnosed patients or in trials of the "pediatric" sarcomas. We have also learned that PFS is subject to significant ascertainment bias. We have learned that if we want to use PFS as our primary end point we must specify prospectively the timing of evaluations and we need centralized and blinded review of the imaging studies we employ to assess progression. To date we have not had good acceptance from regulators that improved PFS, especially from a single trial, is sufficient to justify the registration of a new agent. Event free survival is widely employed as a surrogate for overall survival. It allows us to incorporate secondary malignancy and toxic deaths into our assessment of outcome. It is less well recognized that EFS, just like PFS, is subject to ascertainment bias. When we design our trials using EFS as an endpoint we need to specify prospectively the evaluation schedule to be sure that evaluations are performed at the same intervals in study arms or sequential trials. We need to design our trials with centralized, blinded review of the imaging studies that we use to assess both continued event free survival or the occurrence of an event. Challenges to the use of intermediate endpoints, especially in the absence of blinding and central review of images, are illustrated by the analysis of EFS in the phase 3 MTP study. The clinical endpoints for this study were EFS, as an intermediate endpoint, and OS as the primary study aim. For each analysis, interaction between assigned chemotherapy and MTP was assessed using the proportional hazards regression. A p-value of 0.10 or less was considered evidence of a significant interaction. We performed our analysis of event free survival, based on the number of events we had observed. At the time we published our first report of study results, we still had not observed half of the anticipated deaths, and therefore the study statistician had not carried out an analysis of survival. The first analysis of survival was performed and published at a later date. The test for interaction for event free survival does not rise to the prospectively defined level of significance. It is, however, very close. The importance of a negative test is that it allows us to perform the marginal analyses as prospectively defined. We should not lose sight of the fact that the magnitude of difference is greater in regimen B than in regimen A. It is also important to note that the difference between the effect of MTP in regimens A and B is one of magnitude, not one of direction. Another way to describe this is to suggest that there is no qualitative interaction, but there is a suggestion of a quantitative interaction between the MTP intervention and the chemotherapy intervention when we examine event free survival. Since the test for interaction does not meet the conventional prospectively defined level of significance, we can perform the marginal analyses. If we ignore assignment to receive or not to receive MTP, the addition of ifosfamide to the other three chemotherapy agents had no effect on event free survival as seen in the left panel. If we ignore the chemotherapy assignment, the addition of MTP to chemotherapy was associated with an improved probability for event free survival, seen in the right panel. The probability that this difference arose by chance is 0.08. This does not meet a conventional level of significance, but does suggest a trend toward improved event free survival. We did not propose to prove no interaction, and we cannot conclude that there is no interaction. We proposed only to test for the hypothesis of no interaction to determine if it was legitimate to perform the marginal analyses in the prospective trial design. A trial to exclude any possibility of interaction would have required well over 1800 patients. Despite a negative test for interaction, analysis of EFS by study arm in this trial has created continued questions about the magnitude of difference between the addition of MTP to the two regimens. Since ascertainment bias cannot be ruled out, the importance of this potential interaction (or lack of) cannot be determined. Survival is the ultimate gold standard end point. There are no issues of ascertainment bias. Survival analysis may require many years of followup. It does not include assessment of quality of life. For some pediatric trials, such as in the area of neuro-oncology, it is clear that some therapies are associated with prolongation of survival, but also with very significant compromise of quality of life. It is very likely that we will need to move to QOL adjusted survival as the ultimate gold standard for oncology studies. This is an analysis of overall survival for patients with localized osteosarcoma treated on INT0133. This figure displays overall survival by treatment assignment. Overall survival was very similar for three drug chemotherapy and four drug chemotherapy without MTP, regimens A- and B-. The addition of MTP improved survival for both chemotherapy arms. When we apply the test for interaction to overall survival, there is no hint of interaction. The hazard rations for the addition of MTP to regimen A and regimen B are similar in magnitude, and both show improved overall survival with the addition of MTP to chemotherapy. When we ignore assignment to receive or not to receive MTP, we see that the addition of ifosfamide to the three other chemotherapy agents had no impact on overall survival. When we ignore chemotherapy assignment, we see that the addition of MTP to chemotherapy resulted in a significant improvement in overall survival. The probability that this difference arose by chance is 0.03. In this figure we have depicted the overall survival for the osteosarcoma MTP trial compared to SEER data. Note that survival for patients who were treated with chemotherapy but did not receive MTP is the same as the SEER data. The addition of MTP to chemotherapy resulted in a clinically meaningful and statistically significant improvement in survival with no incremental toxicity. It is important to note that the SEER data provides reassurance that the observed difference is not due to inferior outcome for the patients treated with chemotherapy alone. Obviously quality of life incorporates survival and adds a dimension related to non-lethal toxicities. This is increasingly considered the optimal end point for studies of cancer therapies. Both survival and QOL require very long followup to make meaningful conclusions about therapeutic interventions. It is critical that we design all of our trials, even phase II trials, to capture survival and QOL outcome data. This will require that we keep studies open much longer than trials which are limited to PFS or EFS endpoints. It will require us to consider issues of patient crossover to novel agents and how such crossover could affect survival after progression of patients randomized to therapy which does not incorporate the novel agents. The need to maintain studies for longer time will place a significant burden on cooperative groups to expend group resources to keep studies open, and institutional investigators who will need to expend time and resources to keep studies open in followup to acquire and submit data. But every regulatory interaction has demanded this type of data to obtain registration of new agents. A key feature in design of clinical trials is the duration of planned followup. As we have previously noted, we can obtain surrogate endpoints much more quickly in late stage patients than early ones and in all cases, more quickly than survival. However, survival is much more robust and viewed by regulators as the gold standard. We must recognize that we will need these data and anticipate much longer duration of followup than we are accustomed to design into our trials. We must plan to follow every study participant essentially for life. In our prospective randomized clinical trial to assess MTP in osteosarcoma, the cooperative group made a very unfortunate decision to close the trial to follow-up in March, 2007. This meant that our ability to track patient vital status ceased. The regulators want to hold us to a standard of accountability of 95% completeness for all study participants. We meet that criterion at a median follow up of about 3 years, but not beyond. Institutional investigators have been unwilling to approach patients for additional followup because they interpret study closure to terminate their IRB approval to contact patients. Studies must remain open for followup, probably indefinitely. This has important implications as we design our phase II and phase III studies of IGF inhibition in sarcomas. We will need to be sure that our phase II trials are designed to capture overall survival, something we have not previously done, and we will need to insure that our phase III trials remain open indefinitely to accrue information about patient vital status which will be essential for regulatory submissions. Unplanned analyses are frequently performed after the completion of a study to explore new questions or issues that may have been identified during the study or review of the data. Subgroup analyses by demographic characteristics are expected by regulators, but again should be viewed as exploratory. These can provide support for the robustness of the data and new insights into questions that can be asked in future studies. This Forest Plot illustrates the consistency of results across a broad range of demographic and prognostic factors. Analyses were conducted based on demographic factors such as race, gender, age and prognostic indicators such as LDH, and tumor size. Hazard ratios less than one that favor MTP appear as boxes on the left side of the vertical line and the size of each subset is relative to size of the box. With one exception, patients 16 years and older, the direction of the treatment effect favors MTP. Further exploratory analyses focused on this age group have produced some interesting results and illustrate the kinds of questions such analyses can generate. In the ISIS study, the investigators performed a subgroup analysis by the patient’s Zodiac sign. They noted that Libras and Pisces has an inferior outcome. As discussed by the ISIS investigators that include Sir Richard Peto and Sir Richard Doll caution must be used in interpreting subgroup analysis. In the smaller group of patients older than 16, there was a greater proportion of individuals with unfavorable responses in the MTP arms. Histologic response to induction therapy is one of the best predictors of survival. The stratification at randomization led to balance between treatment arms in the other important prognostic indicators for survival in osteosarcoma, including LDH level and site of tumor. Histologic response was not determined until after induction therapy and surgery and could not be controlled at randomization. In the larger group of patients less than 16, a good balance in favorable response was seen. Shown on the left is an analysis of disease free survival by treatment arm in the phase 3 MTP study excluding patients less than 16 years of age. In this analysis, unlike the ITT analysis of DFS or EFS, any suggestion of interaction has disappeared and these graphs are completely predictive of the overall survival outcome shown in the right panel. The smaller size of the over 16 group and the excess of poor histologic responders in the MTP arms contribute to the findings seen in the Forest plot and completely account for the suggestion of interaction between MTP and ifosfamide in the EFS analysis. When we use overall survival to evaluate an intervention in newly diagnosed patients with cancer, there is a concern that variability in post-relapse, or retrieval therapy, might influence subsequent survival. Certainly we have examples of disease where therapy following first relapse can have a marked impact on subsequent survival. In hematologic malignancies, the application of allogeneic bone marrow transplant following relapse after initial therapy can be curative, dramatically altering survival rates. In the past, we have struggled to demonstrate the benefit of chemotherapy in most sarcomas in front-line treatment. There has been no demonstration of survival benefit for systemic therapy following recurrence. In osteosarcoma, very large cohorts of patients have been analyzed following recurrence. There is unanimous agreement that there are no survivors if we are unable to perform surgery to remove all sites of clinically detectable recurrent disease. There has been no impact of chemotherapy on post relapse survival, especially in the era during which we conducted INT0133. We analyzed our patients following recurrence after initial therapy on INT0133 and there was no difference in the frequency of patients who underwent surgical resection for metastatic recurrent disease. Survival is the ultimate endpoint, and not subject to ascertainment bias or lack of central review. When we examine the introduction of new biological agents for the treatment of sarcomas, it will be critical to consider the benefit:risk ratio. We will certainly require a robust indication of benefit. We will want to be sure that we monitor risk in the setting where the agent will be in clinical use, for example, in conjunction with chemotherapy. Agents with favorable toxicity profiles should have a higher priority for introduction into treatment than agents with greater toxicity and risk. Whenever we add to our current therapies, we must consider how we will move beyond this agent to the next improvement. Will the introduction of a new agent compromise our ability to introduce yet additional agents in the future? The better the toxicity profile, the less risk that a new agent will prevent the incorporation of additional treatment strategies in future trials. Our prospective randomized phase III trial of MTP in osteosarcoma demonstrated a robust 30% reduction in the risk of death. We saw no grade 3 or 4 toxicity attributable to MTP. This extremely favorable benefit/risk ratio argues strongly in favor for the approval of MTP for the treatment of osteosarcoma. Our early experience with inhibition of the IGF pathway by monoclonal antibody against IGF1R suggest a very favorable toxicity profile. Phase II studies of these monoclonal antibodies in combination with chemotherapy for carcinomas have shown no increased toxicity from either chemotherapy or the biological. It is probable that we will see a favorable benefit risk ratio in phase III trials in sarcomas. There are several regulatory issues that have arisen in discussions about the development of biological agents for the treatment of sarcomas. Do we need to perform our randomized trials in a double blinded manner using placebo controls? Will we be able to obtain large sample size? Do we need large sample size? Will we need to perform confirmatory studies after an initial study which detects benefit? Ethicists who have considered the question have generally concluded that placebos are unacceptable for minors. For example, in some IGF1R monoclonal antibody trials, the agent is administered weekly by intravenous infusion. The administration of weekly infusions of placebo to minors incurs risks of infection generally considered ethically unacceptable. In our trial of MTP, we required demonstration of fever and chills with the first administration of drug before allowing premedication. What would be an appropriate placebo? Either we would use an agent which did not cause fever and chills, and therefore was obviously a placebo, or use an agent which did cause fever and chills, and by definition put patients at risk. We have been told by at least one pharmaceutical that the IGF1R formulation has physico-chemical characteristics that make it almost impossible to devise a placebo that would fool the compounding pharmacist. When we consider sample sizes, we are confronted by the fact that all sarcomas are rare, rare enough to be considered orphan diseases. Our track record in pediatric oncology is one phase III randomized trial per decade for osteosarcoma and Ewing sarcoma. For both these diagnoses, our most recent clinical trials required development of international consortia to achieve the patient numbers needed to achieve adequate power to address the study questions. How will we design trials of new agents in sarcoma to have adequate power to address study questions and to have adequate power that will not require confirmatory studies that will delay even further the availability of these new agents to our patients? Our phase III prospective randomized trial of the addition of MTP to chemotherapy for osteosarcoma is the largest prospective randomized trial in osteosarcoma ever completed. The sample size was roughly half the population of eligible children. We demonstrated a robust survival advantage with a favorable benefit:risk ratio. Mounting a successor study would be very complicated. Many investigators would find it difficult to withhold MTP from young patients with osteosarcoma, so conducting a trial in which patients were assigned not to receive this agent would accrue slowly. We will certainly be moving forward with trials of IGF1 inhibitors. We will certainly be developing other biological and targeted therapies. We will need to be able to combine these novel therapies with our existing therapies and incorporate them into our standard clinical practice. We have a responsibility to our patients to test every new agent rigorously to insure that we have robust information about benefit and risk. But we also have a responsibility to bring the safe and active new agents to our patients as rapidly as we can. We need to be thoughtful and pro-active as we design our studies to be sure that we acquire all the relevant data that will allow these studies to support an indication for the new agent. I hope that my description of our experience with MTP has been informative for you and that my thoughts about IGF1R inhibitors have helped clarify for you some of the issues we face as we develop novel therapies for patients with sarcomas. I wish to thank CTOS and the Axelrads for the honor of allowing me to present to you today, and I welcome any questions. This special feature was not peer-reviewed. it might improve that age group's chances of survival." -- Miranda Hitti, WebMD News release, John Wiley & Sons, Inc.
We have also previously noted an age-dependent correlation between outcome improvement, as measured by improvement in survival over time periods, for all invasive cancers analyzed in aggregate and the rate of clinical trial participation in the age subgroups (Ref. 3). This observation suggested that a major reason for the deficit in outcome improvement in young adults was their relative lack of inclusion and participation in clinical trials and the associated lack of scientific advancement and discovery of more effective therapies. In the U.S., sarcomas account for 9.1% and 2.9% of all invasive cancers in 15- to 29-year-olds and 30- to 44-year-olds, respectively (U.S. Surveillance, Epidemiology, and End-Results data; see SEER Data below). In these age groups, soft-tissue sarcomas predominate, including synovial cell sarcoma, malignant fibrous histiocytoma, peripheral primitive neuroectodermal soft-tissue tumors, rhabdomyosarcoma and Kaposi’s sarcoma. The remainder are bone tumors, primarily osteosarcoma and Ewing’s sarcoma. A comparison in Australia among young adult and older adolescents with bone sarcomas suggested that survival and clinical trial activity were correlated (Ref. 4). We therefore evaluated clinical trial participation as an explanation for an observed relative lack of outcome improvement in young adults with sarcoma. For this study, we evaluated the 5-year survival in young adults in the U.S. who were diagnosed between 1975 and 1998 to have a sarcoma and followed by the Surveillance, Epidemiology and End Results (SEER) program of the National Cancer Institute. Survival data was available on 38,144 patients less than 45 years of age, of which 33,618 had sarcomas of soft-tissue and 4,326 had bone sarcomas. The SEER Program currently collects and publishes cancer incidence and survival data from 14 population-based cancer registries and three supplemental registries covering approximately 26 percent of the U.S. population. The U.S. NCI Cancer Therapy Evaluation Program (CTEP) requires that all of its sponsored clinical trial sites submit accrual data electronically on a quarterly basis. Accrual data was therefore obtained from CTEP on 2,242 patients with soft-tissue (2,295) and bone sarcomas (947) entered on national sarcoma treatment trials from 1997 to 2002. The accrual proportion was expressed as the ratio of accruals on national treatment trials to the number of new cases of cancers diagnosed during the interval of accrual estimated from the SEER incidence rate and the 2000 U.S. census for each age group analyzed. The yearly change in five year survival rates, averaged over the 23 years studied (the average annual percent change), was compared with accrual and accrual proportion as a function of patient age. Only those age groups that had at least 100 patients in each 5-year age group were analyzed. The histopathology types were based on to the International Classification of Childhood Cancer (ICCC) system. Note that this classification scheme separates Ewing's Sarcoma (EWS) occurring in soft tissue (peripheral primitive neuroectodermal tumors) from EWS of bone. Gynecologic sarcomas (sarcomas of the uterus and ovary) were not included since they did not meet the minimum criteria of 100 patients per age group in the majority of age intervals analyzed. 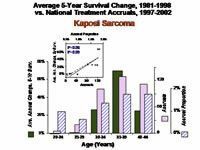 For all bone and soft-tissue sarcomas except Kaposi’s sarcoma (KS), the least progress in improving the 5-year survival during 1975-1998 occurred for patients between the ages of 20 and 40. For patients with soft-tissue sarcomas (inclusive of KS), the average annual percent change in survival was actually negative for 1975-1998, meaning that the 5 year survival for all soft tissue sarcoma (STS) together was worse in 1998 than in 1975. This was due to decreases in 5-year survival among young adults with sarcomas in ICCC categories IX(b) (rhabdomyosarcoma and embryonal sarcoma) and IX(d) (synovial cell sarcoma, malignant fibrous hystiocytoma, peripheral primitive neuroectodermal soft-tissue tumors including malignant peripheral nerve sheet tumor, and related tumors). Among patients with bone sarcomas, the least improvement occurred between 25 and 35 years of age (Figure 1, solid bars). The greatest improvement in five-year survival was seen in people with KS, particularly those aged 30-44. 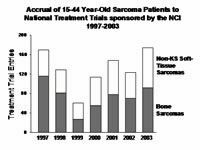 Sarcoma patients aged 20-44 had the lowest rate of participation in national treatment trials monitored by the NCI. Among patients with soft-tissue sarcomas, the average annual accrual rate ranged from a high of 33% (61 of an estimated 183 available patients <5 years of age) to a low of 0.3% (4 in 1,513 25- to 29-year-old patients. Above age 35 the accrual proportion increased to 0.7%. Among patients with bone sarcomas, the average annual accrual proportion was inversely proportional to age, ranging from a high of 6 of 11 patients among those <5 years of age to 0 of 183 available patients among 40- to 44-year-olds (Figure 1, hatched bars). In both soft-tissue and bone sarcoma patients, a precipitous decrease in the number and proportion of patients with sarcoma accrued to clinical trials occurred above age 20. Among the soft-tissue sarcoma patients, the vast majority of treatment trial entries between 25 and 45 years of age were in patients with Kaposi’s sarcoma (KS). When considered as a separate group, KS patients had their peak participation at age 35 to 39, in both absolute accrual (average of 21 patients per year) and accrual proportion (1.8%). This age-dependent pattern is the reverse of that seen in the other soft-tissue sarcomas and in the bone sarcomas. Patients with the least improvement in survival had the lowest rate of participation and the patients with the greatest survival improvement also had the highest participation in NCI-sponsored clinical trials. 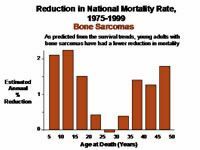 For bone sarcomas, the reduction in mortality rate mirrored the average annual percent change in 5-year survival, with no significant improvement among 20- to 34-year-olds from 1975 to 1999 (Figure 2). There was a statistically significant age-dependent correlation between survival improvement and clinical trial participation rates whether or not the type of sarcoma evaluated had a rate decline in young adults (non-KS soft-tissue sarcomas and bone sarcomas, Figure 1) or a peak (KS sarcomas, Figure 3). This rate-pattern independence is consistent with a cause and effect relationship. Moreover, reversing the national accrual trend in KS was temporally associated with a reversal in the survival trend, further supporting a cause and effect relationship. Thus, a possible, practical solution to improving survival in young adults with sarcoma is to increase their participation in clinical trials that are dedicated to the development and study of new therapies. This study also compared the clinical trial participation of all cancer patients with the participation of patients with non-KS sarcomas on national trials. Except for 25- to 34-year-olds (Figure 4), participation in sarcoma trials is lower in all age groups. From age 25 up, the proportion is less than 30% of the proportion in all cancer. This means that except for Kaposi sarcoma, the U.S. is not entering sarcoma patients onto clinical trials as well as it is on cancer in general. From 1997 to 2003, accrual to sarcoma trials among 15- to 44-year-old patients groups has not had sustained increases (Figure 5). In comparison, the number of treatment trial entries by adults over 45 years of age increased 40% from 1997-1998 to 2003-2004. In the study, we found that improvement in cancer survival was less for patients aged 15-44 in the U.S. with sarcomas, and that this may have been a result, at least in part, of their relative lack of participation in clinical trials. This supports the concept that clinical trials are one of the critical pathways to improved outcomes for cancer patients. It should be stressed that this data does not prove that the individual patient participating in a clinical trial is benefiting per se. Whereas this may happen for other reasons, the study and its finding apply to populations of patients and should not be applied directly to an individual patient. Clinical trials can help patients of the future, and current patients enjoy the benefits provided by prior patients who entered clinical trials. Although there are no easy solutions to the accrual dilemma, the recent improvement in the overall cancer treatment trial participation rate by adults over 45 years of age and the specific experience with KS demonstrate that the obstacles can be overcome. Reversing the deficits among young adults and older adolescents with sarcomas will require broad support and cooperation to increase clinical trial availability, access, and participation. Non-KS soft-tissue sarcomas should require special emphasis since among the types of sarcoma that occur in young adults they have shown the least progress and they represent half of all sarcomas. Intergroup and cancer center collaboration is paramount to overcoming the deficits in young adults and older adolescents with sarcoma. To this end, the Children’s Oncology Group (COG) formalized an Adolescent and Young Adult (AYA) program in 2000, with an initial focus on sarcomas. In 2002, an adult-pediatric intergroup sarcoma clinical trial collaboration was initiated under the auspices of the Southwest Oncology Group. This has led to the formation of the Intergroup Consortium Against Sarcoma (ICAS), which has representation from each of the adult and pediatric cooperative groups in the U.S., as well as the National Cancer Institute of Canada. The fact that the most recent year, 2003, had the greatest accrual of non-KS sarcomas since 1997 (Figure 4) may be the first sign of success of the COG and ICAS initiatives. 1. Bleyer A, Ries L. U.S. Cancer incidence, mortality and survival: Young adults are lagging further behind. Proc Am Soc Clin Oncol 21: 389a, 2002. 2. Bleyer WA: Overview: Cancer in adolescents and young adults: Epidemiology, diagnosis, treatment, survival, and importance of clinical trials. Med Pediat Oncol. 38:1-10, 2002. 3. Bleyer A, Montello M, Budd T, Saxman S. Proc Am Soc Clin Oncol 22:816, 2003. 4. Mitchell AE, Scarcella DL, Rigutto GL, et al. Med J Aust; 180:59-62, 2004. V2N3 ESUN. Copyright © 2005 Liddy Shriver Sarcoma Initiative.